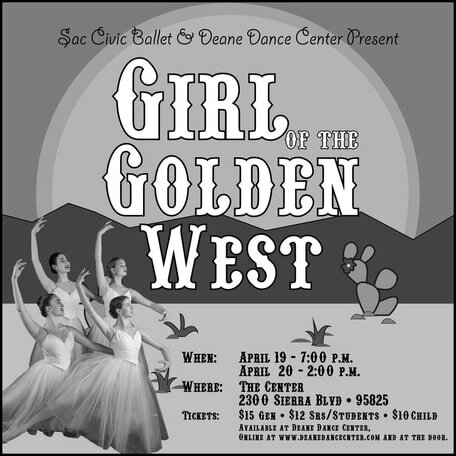 Sac Civic Ballet and the Deane Dance Center will present the world premier of its new ballet, Girl of the Golden West, on Easter weekend. Choreograped by Don Schwennesen, the story is loosely based on the play and Opera by Puccini. Set to new music the ballet tells the story of multiple characters in a small California mining town during the Gold Rush. It has several references to the Sacramento, including the arrival of the Sisters of Mercy in the 1850s.